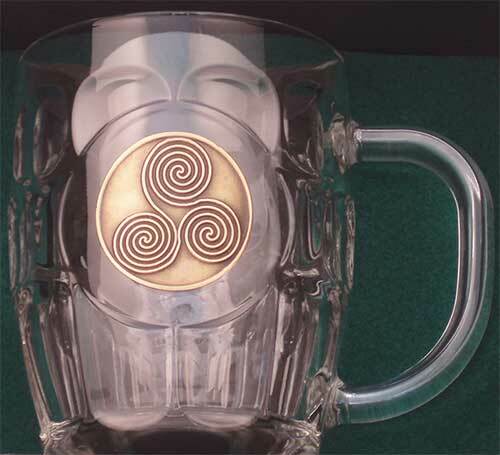 Celtic tankard features a gold plated medallion that is enhanced with an embossed Newgrange spiral. This Newgrange tankard is a heavy weight glass design that stands 5" tall and measures 3 5/8" wide at the rim. 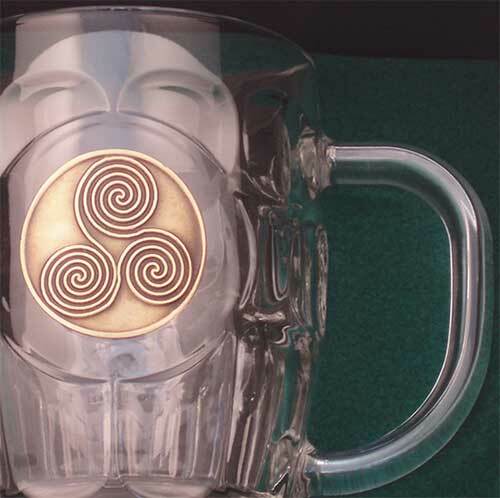 This Celtic tankard features a gold plated over pewter Newgrange spiral emblem. The Celtic spiral tankard is a glass hobnail style mug that holds 20 ounces of your favorite beer or beverage. The dishwasher safe Irish beer mug is made in the United States and it is gift boxed with a Celtic spiral history card, complements of The Irish Gift House. Celtic tankard features a pewter medallion that is enhanced with an embossed the Newgrange spiral. Celtic tankard features an embossed pewter medallion that is enhanced with a traditional Trinity knot. Celtic tankard features an embossed gold plated medallion that is enhanced with the Trinity knot. Claddagh tankard features a gold plated medallion that is enhanced with Celtic knot-work along with the Irish word sláinte. Claddagh tankard features an embossed pewter medallion that is enhanced with Celtic knots.